Royal Elm Burl is a sublime Soprano ukulele constructed of curly California (or Claro) Walnut paired with a Western Red Cedar soundboard. A stately piece of Elm Burl carefully caps the peg heads along the genuine Honduran Mahogany neck. Fun fact, Elm Burl is the same lush wood as found in the dashboard of a Rolls Royce, and gives this ukulele untold refinement. The fret markers on the Rosewood fingerboard are wooden inlays and the edge binding is comprised of Rosewood with a fine white purfling. 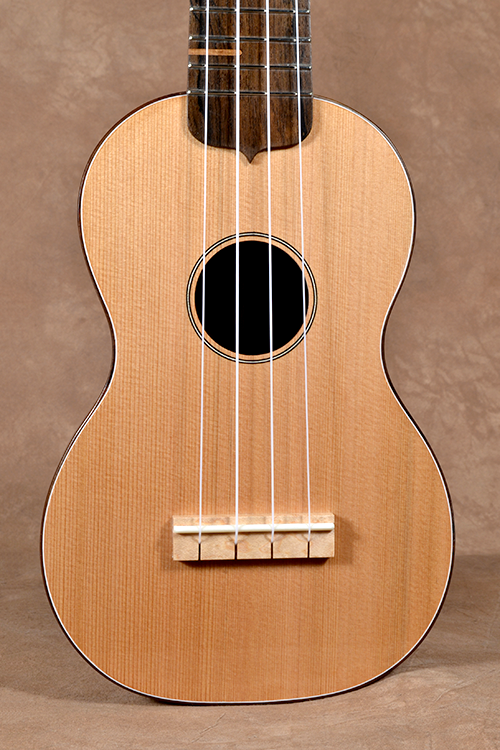 The back of the instrument is arched nicely as all Pohaku ukuleles are with a luxurious and smooth as silk finish that shines. Peg Hed brand planetary tuners make tuning easy and Pohaku craftsmanship make the Royal Elm Burl a joy to play and show off. Its intonation is excellent and is louder than it should be with a well balanced EQ across the strings. The ukulele comes with a hardshell case. It is approx. 21” long and weighs about 14 ozs. Price is $950 plus sales tax in Calfornia. Shipping is $40 to the mainland U.S.